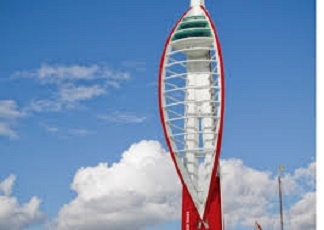 Portsmouth locals have been up in arms following the recent news that the United Arab Emirates airline has demanded popular retail and leisure outlet Gunwharf be made alcohol free as condition of them sponsoring the famous Spinnaker tower. The ban which will include anywhere within a 1/4 mile radius of the tower itself is thought to be set for the full duration of the five year sponsorship deal and will be enforced by security guards on segways. Portsmouth Council Leader Donna Jones defended her decision. “It’s all about the money. As a city we should be looking to roll over and have our tummy tickled by whoever has a bit of cash, be they a multi-national corporation or an airline backed by a country with a dubious human rights record” She told us. The move had previously been popular in Southampton due to the Emirates additional stipulation that the Spinnaker tower be painted red and white in their own football team colours. However one fan told us that this had been tarnished by the alcohol ban. “No point in going over there to gloat if you can’t have a drink” He explained. A spokesman for Gunwharf told us that they would still be expecting large numbers of revellers on Friday and Saturday evenings.